Don't let your child be a victim of cyber bullying. Protect your children from online predators by blocking Internet access with Browser Lock. Browser Lock runs quietly in the background and prevents access to the Internet, via a browser, while you're away. To enable access to the Internet you just need to put in your password. Helps to protect your kids or employees from Internet abuse. Puts the parent or manager back in control of Internet use. ...... (Any Version), Mozilla (Any Version), Safari (Any Version), Google Chrome (Any Version). Prevents unauthorized shutdowns via Task Manager. Starts with Windows and runs in the background. Will NOT block email, chat, file sharing or online video games from Internet access. Set a time limit to allow access to the Internet. Requires a master password that will be required when you want to access the Internet. Helps to protect your kids or employees from Internet abuse. Puts the parent or manager back in control of Internet use. Qweas is providing links to TPD Browser Lock 2.0.1 as a courtesy, and makes no representations regarding TPD Browser Lock or any other applications or any information related thereto. 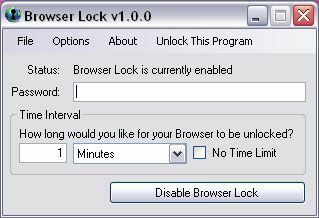 Any questions, complaints or claims regarding this application TPD Browser Lock 2.0.1 must be directed to the appropriate software vendor. You may click the publisher link of TPD Browser Lock on the top of this page to get more details about the vendor.